These luscious, creamy chocolate truffles are handmade by Brigittine monks at Our Lady of Consolation Priory in Amity, Oregon. Their fudge has given them a lasting reputation as skilled confectioners; these divine treats are sure to uphold that reputation and please any discriminating chocolate lover! 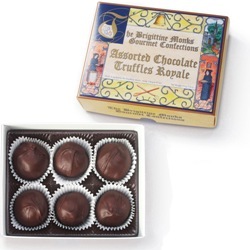 Six very large truffles in each handsome gift box total almost half a pound. 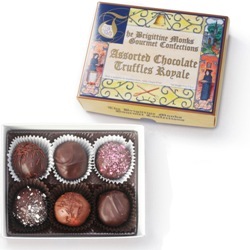 Assortment (shown) contains six large truffles, one each of milk chocolate, extra dark, cherry, maple, raspberry & amaretto. 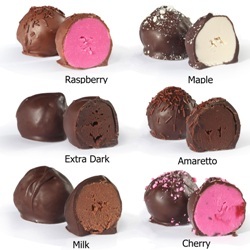 All Extra Dark contains six large truffles, filled with smooth, extra dark chocolate. All Milk Chocolate contains six large truffles, filled with rich, creamy milk chocolate. 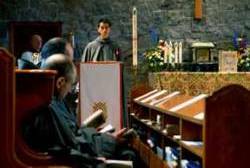 The monks of Our Lady of Consolation Priory live according to the ancient Rule of St. Augustine, a guide for religious life written in about the year 400. St. Bridget, who founded the Order of the Most Holy Savior (the "Brigittines" included monks and nuns) in 1370, modified the precepts slightly, having been influenced by Cistercian monks. 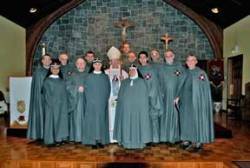 Our Lady of Consolation Priory's founder, Brother Benedict Kirby (1929-1998), was one of several men in the 20th century to have the dream of restoring the male branch of the Brigittine Order, whose last member had died in 1863. Circumstances didn't allow the others to succeed, but this, the only house of the order, has now survived for well over 30 years. 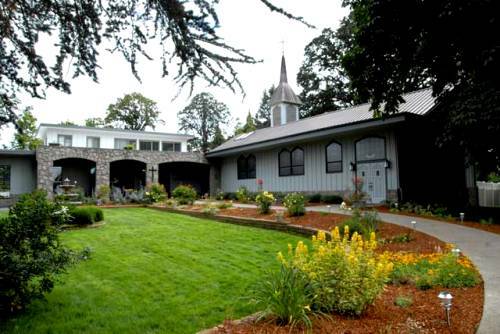 The monastery is on 44 acres situated 55 miles southwest of Portland. 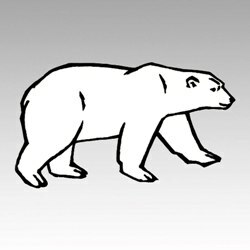 Brigittine Monks Gourmet Confections began in 1982 as a way for the monastery to offset some of its expenses, but the business has grown so steadily each year that the sales of their fudge and truffles have now become the order's sole source of income. Jan 21, 2019 | By Sheryl W.
Delicious and large! Filling was fresh and flavorful. Lots of thick chocolate. Yum! Jan 1, 2019 | By carla s.
Awesome. My mother-in-law loved them! Apr 16, 2018 | By RICHARD S.
Excellent product for fans of dark chocolate! That was the phone call I got from my mother in law about this stocking stuffer present.She love the chocolates. Dec 27, 2017 | By Edith R.
Your dark chocolate truffles are the best ever! I love them & so do family & friends who have tasted them. They are not too bitter & not too sweet; they are smooth & delicious! Others cannot compare to the quality that you offer. Thanks for making the best chocolate truffles ever! Dec 13, 2017 | By Edith R.
I love chocolate & these are the BEST truffles I have ever tasted! They are not too sweet & not too bitter; just SO good & melt in your mouth! I have given some to multiple family members & ALL say "These are DELICIOUS! Where did you get these from?!" And I say "Monastery Greetings & the Brigittine Monks in Oregon." These are my wife's favorite candy period. Feb 20, 2017 | By Ginny M.
We sent these out as Christmas gifts but kept one package for ourselves (of course). The reviews have been raves. They are so rich and delicious that one should slice them and eat each one over a period of time. Could not have been a better gift. They were a gift to my daughter-in-law. All I know is the family had brown finger tips and the truffles didn't last the weekend. Jan 8, 2017 | By fred s.
Dec 22, 2015 | By Nancy D.